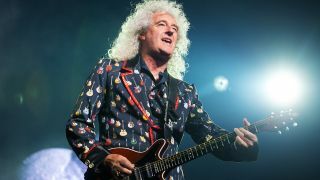 Queen’s Brian May has announced that he’ll release a brand new solo single titled New Horizons on January 1. The track will mark the guitarist’s first solo work since the single Why Don’t We Try Again from his 1998 album Another World – and it will premiere from NASA control headquarters in Maryland at 12.02am ET (5.02am GMT) and will be broadcast live. May wrote the song with Don Black earlier this month, with New Horizons May’s personal tribute to the NASA New Horizons mission, which will encounter a remote Kuiper Belt Object named Ultima Thule, far beyond Pluto on the edges of the solar system on New Year’s Day. It will be the most distant spacecraft flyby in history. New Horizons (Ultima Thule mix) celebrates the probe's 12-year journey and will include a message from Stephen Hawking congratulating the team on their successful rendezvous with Pluto three years ago. May says: “This project has energised me in a new way. For me it’s been an exciting challenge to bring two sides of my life together – astronomy and music. For me it’s been an exciting challenge to bring two sides of my life together – astronomy and music. “It was Alan Stern, the project instigator of this amazing NASA mission, who threw down the glove last May. He asked if I could come up with a theme for Ultima Thule which could be played as the probe reached this new destination. May says the project “epitomises the human spirit’s unceasing desire to understand the universe we inhabit” and adds: “Everyone who has devoted so much energy to this mission since its launch in January 2006 will be feeling they are actually inside that small but intrepid vehicle as it pulls off another spectacular close encounter. May has teased some of the track on Instagram. Check it out below. Earlier this year, May collaborated with astronomy journalist Dave Eicher to produced the publication Mission Moon 3D. The book takes readers on a journey through the events leading up to Apollo 11’s moon landing in 1969, with the publication featuring more than 150 views – including previously unseen shots from the NASA archives and from Russian sources – and is presented in full-colour stereoscopic 3D.